'Lo darlings. Just some random things to share with you until I start wearing polish again. First off, if you haven't already done so, go pick a polish that you want to see. You can do that here. Next, I was at Aldo today and found they sold nail polish. I didn't have my camera with me, so I can't show you what colours they have. But it's seven colours and one clear. There are two pink cremes, two red cremes, a purple creme, a blue creme, and a turquoise shimmer. I bought the turquoise. It's called Poolside in Malibu. I hope the gold shimmer in the bottle shows up on the nail. The polishes are $6 CAD. If anyone really wants to see swatches of this, you could pick it here. Just sayin'. Lol. It's a bit dark, but it's colour accurate. I didn't manage to capture the shimmer though. *Looks at entry* I'm pretty verbose aren't I? *Sigh* Why couldn't I ever manage to channel that into papers? Anyhow, I got a cat. I belong in the nail polish circle now. Hahahaha. 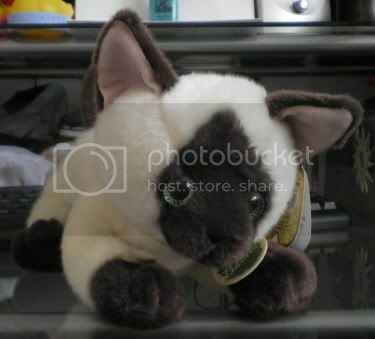 No, it's a plush siamese cat, very cute. Have a looksee. It doesn't have a name yet. I'm totally open to suggestions. That's it for now. Oh, I've also added some new polishes to the spreadsheet for anyone that's interested. Name him after one of your favorite polishes! Cool polish. *sigh* Another retail store with it's own polish brand. I complain yet I know I'll probably buy some. Is that cat from Claire's? I wonder how close this polish is to AA's Peacock? I think they look pretty similar in the bottle (though I'm going from memory for Peacock). Did you find them in the shoe store or the accessory store? Er, I missed the part about the gold shimmer so I guess it can't be quite the same as Peacock. Peacock is also more blue. Oh, and I found them in the shoe store. spifftiff88: Yes indeedy it's from Claire's.